Our Kelvion supplied evaporators are offered as ‘Off the shelf’ commercial designs or customisable for industrial refrigeration. Evaporators are available in a wide range of material, tube configurations, fans with external static pressure and accessories. 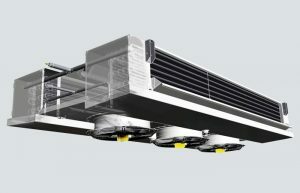 Typically utilised for refrigeration applications such as cool rooms, freezers etc.